Each of us needs a safe haven in this world, a refuge that offers ease and comfort during troubled times. For some this may be a peaceful spot in a sunny garden. For others it may be the supportive arms of a loved one, or perhaps even a favorite activity like a long run along a familiar country road. These soothing sanctuaries envelop us with a sense of safety and protection when we feel most buffeted by the tumultuous winds of life. They also foster moments of peace that allow us to feel utterly unthreatened by danger, and they leave us feeling calmed, softened and able once again to breathe a few easy breaths. For me, supported child’s pose, or salamba balasana, offers just such a shelter from the storm. This forward-bending posture soothes frazzled nerves, eases stifled breathing, and gently supports the vital energy centers of the belly, heart and head. Its tightly wrapped form shelters the organs of the front body, inviting our protective holding patterns to soften and dissolve. And exploration of the pose reminds us that yielding and surrender can be just as important survival strategies as will and effort. I consider supported child’s pose a good friend I can turn to when the world has wearied my heart or when my mind cries out for comfort and relief. My favorite version of this asana is a bit prop heavy, but I do believe that rounding up every last blanket in the house is well worth the effort when exploring supported child’s pose. So be patient with the preparation, and trust that your body and mind will be well rewarded in the end. To begin, fold six thick blankets so that each is about eight to 12 inches wide and long enough to support both your spine and head when you fold forward. Neatly stack four of the blankets atop one another and position them on your yoga mat. Form a second stack with the last two blankets and place the blankets within arms-reach nearby. Straddle the thicker blanket stack so that the base of your pelvis is on the support and your knees, shins and top feet rest on the floor at either side. Shimmy your hips toward the back end of the bolster and settle here for just a few breaths, readjusting your knees and feet if necessary to maximize your sense of comfort and ease in the pose. 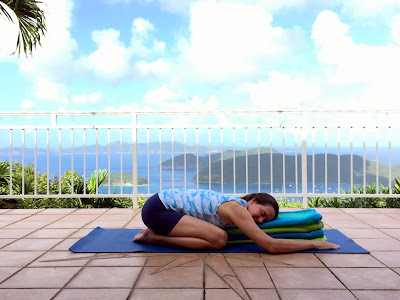 Now place your smaller, two-blanket stack in front of you atop the bolster you’ve already created, and then slip this second stack toward your pelvis and in between your knees. Take care to ensure that all six blankets are neat and even, so that when you fold forward the bolster you’ve created will feel smooth and firm. Adjust your position so that you are sitting comfortably on the base of the pelvis, and then rise upward through the heart and broaden the collar bones so that the front body feels long and spacious. Close your eyes, breathe deeply and enjoy the opportunity to sit quietly while inviting the legs to drape easily toward the floor. Soften your skin, deepen your breath, and invite feelings of tenderness and tranquility to melt inward toward your core. When you’re ready to nestle into child’s pose, inhale as you stretch the spine upward toward the sky and then exhale as you fold forward from the hips to let the torso settle into the support you’ve created in front of you. Take care to lengthen the front spine as you release forward, leaving ample space for the torso to stretch out fully. Turn your head to one side and rest it on the blankets as you relax your arms comfortably on the floor at either side of the bolster. Once you’re settled, your belly, heart and head should all rest contentedly on the cushions beneath you. If this isn’t the case for you, consider making a few adjustments so that the shape of your blanket stack supports and nourishes the needs of your own body. First, consider adding or removing blankets to find a more comfortable distance from the floor. If you are tight in the hips or achy in the knees, for example, you might like to have more support beneath your pelvis when you rest forward. If this is the case for you, round up another blanket or two and add it to the thick stack on which you’ve been sitting. This added distance between the pelvis and the ground will create a little more space for the legs to unfurl and also relieve some of the pressure you may feel in the knees and feet. If, on the other hand, you feel like you’re dangling precipitously from your blankets, you might want to subtract a few blankets from the mix. You might even prefer a less-supported version of the pose, where the hips rest on the heels in the traditional version of child's pose and just the upper body rests on a bolster. Second, consider shifting the upper blanket stack either closer to or father away from your pelvis until you find a comfortable position for your abdomen. There’s no right or wrong to the placement of the blankets here. Some simply prefer more support in the deep belly, while others do not. Feel free to experiment with your setup to unearth the perfect arrangement for you. Third, make sure your head is well-supported instead of dangling off the front edge of your blankets. If the head isn’t resting comfortably, slip another blanket or a firm pillow beneath the far end of the stack until the chin and forehead are level and even. And finally, if as you rest here you feel like any part of your front torso is unable to fully surrender, consider wedging a small blanket or towel between that part of your body and the support beneath. I often roll up a thin blanket and slip it just beneath my collarbones at the level of my sternum, so that my throat and heart are able to fully unknot and settle. You may find another part of your body that responds well to additional support. You’ll know you’ve found just the right arrangement when you feel yourself dropping into the blankets beneath you with a blissful smile and a gigantic sigh of relief. Once this happens, your only job is to settle in and surrender. Encourage every cell in your body to soften and unclench, so that with each breath you feel yourself melting farther into the cushion of support beneath you. As you rest here, invite gravity to pull the legs deeply toward the earth to release any lingering tension in the hips and thighs. Soften the muscles of the lower back and release the tailbone toward the heels. At the same time, invite your shoulder blades to spread apart as your arms dangle like vines toward the floor beneath you. Unwind, soften and let go. Close your eyes, unfurrow the brow, and release the jaw. Unclench your hands and feet. Invite the armoring around your back to dissolve so that the skin feels soft and unwrinkled, forming a blanket of comfort around the body beneath. Encourage the entire body to feel tender, spacious and at ease. After a few minutes in the pose, your torso may have relaxed so much that it needs just a little more space to unravel completely. If this is the case, press your hands into the ground, lift the torso a few inches away from the support, and then slip the belly toward the heart, the heart toward the head, and the head toward the front end of the blanket stack. Slowly release the torso back down onto the blankets, inviting the spine to continue telescoping forward as you do so. Now consider your breath. For the first few moments in supported child’s pose your inhalations and exhalations may feel choppy and short, since the front body is so deeply supported that it isn’t able to participate as fully as usual in the breathing process. But after resting quietly for several minutes, your body will likely discover new breathing patterns that encourage the back body to soften and release in a way that more completely accommodates the ebb and flow of the breath. To encourage such back-body breathing, every time you inhale, invite the shoulder blades and back waistband to rise and spread like a dry sponge absorbing water. And every time you exhale, envision the fibers of the back body melting toward the cushion of support beneath. Let the inhalations be long and wide, filling out all the nooks and crannies of your back. And let the exhalations feel warm, soulful and endless. Enjoy the ease and tranquility that this gentle, undulating rhythm of the breath evokes. Rest in supported child’s pose for as long as you like, turning the head to face the opposite direction when you’re halfway through your time here. Relax the head, relieving your shoulders of the burden of holding the head up high. Encourage the heart to soften into the pillow of ease beneath. Unclench the belly, and let the outer world dissolve away as you draw your awareness inward toward the center of your being. Now envision the back body as a soft blanket surrounding you, offering comfort and shelter from the troubles of the world. Notice how the vital organs of the front body are well-protected by the soft shell of the back body, and invite feelings of safety and comfort to melt into the marrow of your bones. Enjoy this sense of deep relief, inviting every last ounce of tension to drain from your body and into the earth beneath. You can let go of every muscle in your body and still there will be no place to fall. In fact you’ve already fallen - into a deep and soulful space with no end, no threat, and no fear. And all that is left is a beautiful body resting in tranquility and ease.